There are many activities planned for the book festival such as book sales, book signing, events for children and teenagers (Baillie Gifford Children’s Programme), reading workshops, discussion on Scotland’s future etc. Prominent authors that are scheduled to make appearances include Irvine Welsh, Tony Parsons, Malorie Blackman, Darren Shan, Alexander McCall Smith, Sophie Hannah, and Haruki Murakami. 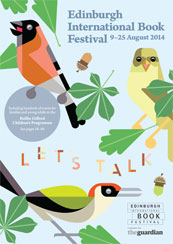 For latest news on the event, visit their official website, Facebook page and/or follow @edbookfest on Twitter. This entry was tagged Author, Event, Interaction, Readers, United Kingdom. Bookmark the permalink. Oh I soo so want to go for this one!! We would have to book a flight to Edinburgh. Any particular reason to go there? I’d like to check out the reading workshops. Never been to one. A number of South African author’s will be attending.